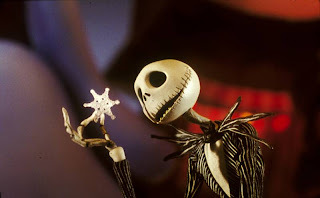 One of my favorite animated movies of all time is not Snow White (which was the first one I ever saw), or Beauty and the Beast (though I did identify with Belle's bookishness), but Tim Burton's Nightmare Before Christmas. Burton has always made movies that appealed to me (Beetlejuice, Edward Scissorhands, Batman), and Nightmare is by far the best in my book. I enjoy the darkness and the humor (also incidentally why I really like Chuck Palahniuk...or maybe I just like Helena Bonham-Carter...). I enjoy the noir and the beauty of the landscapes. 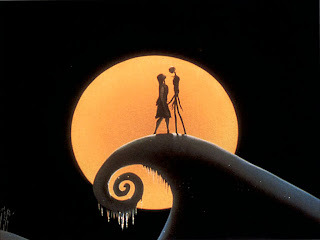 Oh yeah, and I really, really, really, like Halloween...and Jack Skellington. So you can imagine how excited I was when I looked into the beer cooler and spotted this lovely label from Southern Tier. I HAD to get this beer. I mean, how often does one get to spend an evening sipping with the Pumpkin King? I was even more excited when I found that this seasonal was meant to taste much like pumpkin pie! Oh how I love beer that is meant to taste like dessert. The nose on this imperial ale was spicy and fresh - cinnamon, clove, and just a light bit of hops. The flavor was spectacular - sweet and pumpkin at the start, malty at the center, and tapering off into a spicy finish with a hint of saltiness that made me think of my mother's pie crust. The mouth feel was creamy and smooth - reminiscent of whipped cream. The only thing wrong with this beer was that at 8.6% ABV I was unable to enjoy a whole bottle. A girl's gotta be able to get out and trick-or-treat!